The Metro Shuffleboard has been one of the several key names in shuffleboard all over the world. With a long-standing experience in customer service and quality client satisfaction, Hudson has created a one-of-a-kind and timeless product in the Metro Shuffleboard Table. Priding themselves on products of the finest quality, Hudson provides each table with its own set of accessories, supplies for maintenance, and storage to enhance any players’ experience when they’re making a victory or not even playing. As soon as the table arrives, it’ll be ready for playing. Each table comes in one of three popular colors: black, gray, or white finish. The impenetrable playing surface is three inches thick, beautifully crafted from powder-coated steel and complete with a hardwood finish. Hudson’s renowned and critically acclaimed workmanship is more evident in every Metro Shuffleboard Table, with every playing field a work of art in its maple construction. Best of all, there are tables of every size to accompany whatever space you have. Ranging from 9 to 22 feet, you’ll be able to practice shuffleboard wherever you are. 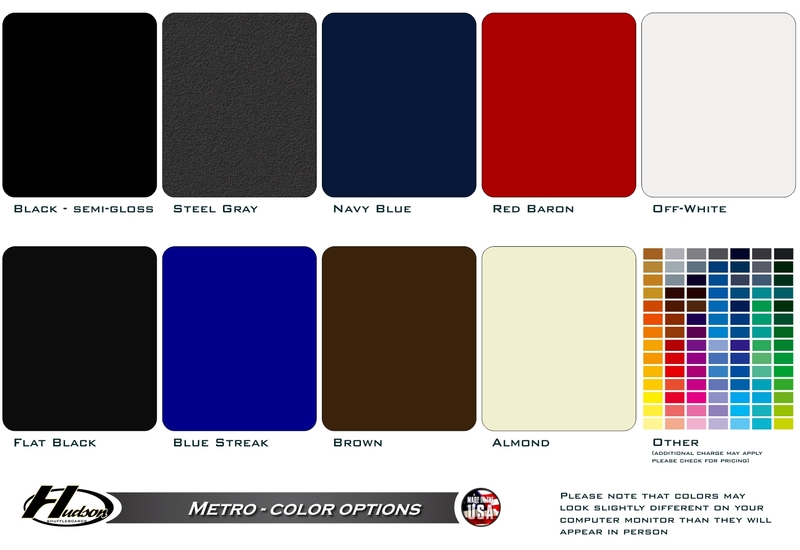 The Metro Shuffleboard table is available in many different color options. 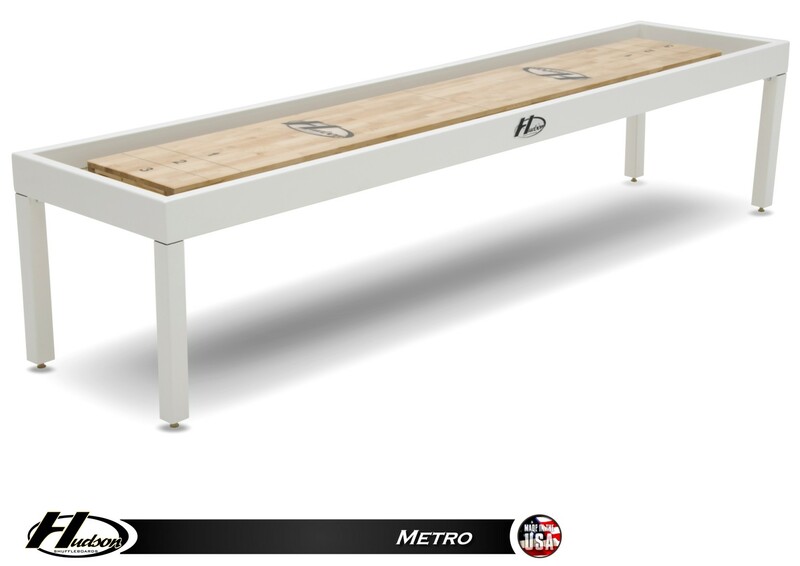 The simple and cutting edge style of the Metro Shuffleboard Table has attracted countless buyers over the years since its release in 2014. Each Metro Shuffleboard Table is hand crafted and comes in a variety of shapes, as Hudson allows each buyer to custom design each piece according to their needs. Whether you’re an indoor or an outdoor shuffleboard player, you’ll be able to have a table that’s more than suited for you. The Metro all-weather outdoor shuffleboard table in with steel gray finish. Best of all, Metro Shuffleboard Tables are especially known for their durability and tendency to not warp over time. With the highest-grade wood and steel being used to construct each table, its construction leads to longer playability and more time with this product. Make your victories come to life in the dark with a playing surface covered in glow-in-the-dark epoxy. In addition, you can choose to add a solid maple black light set to get the full experience from your vibrant table. Your table can arrive wherever you need in two pieces, with wooden dowels to ensure quality installation. This option is ideal if space is a concern for you. If playing shuffleboard outdoors is more your style, you can opt to weather-proof your table by sealing the playing surface with waterproof fiberglass and replacing the carpets with marine-grade carpeting, all without retracting from your playing experience. 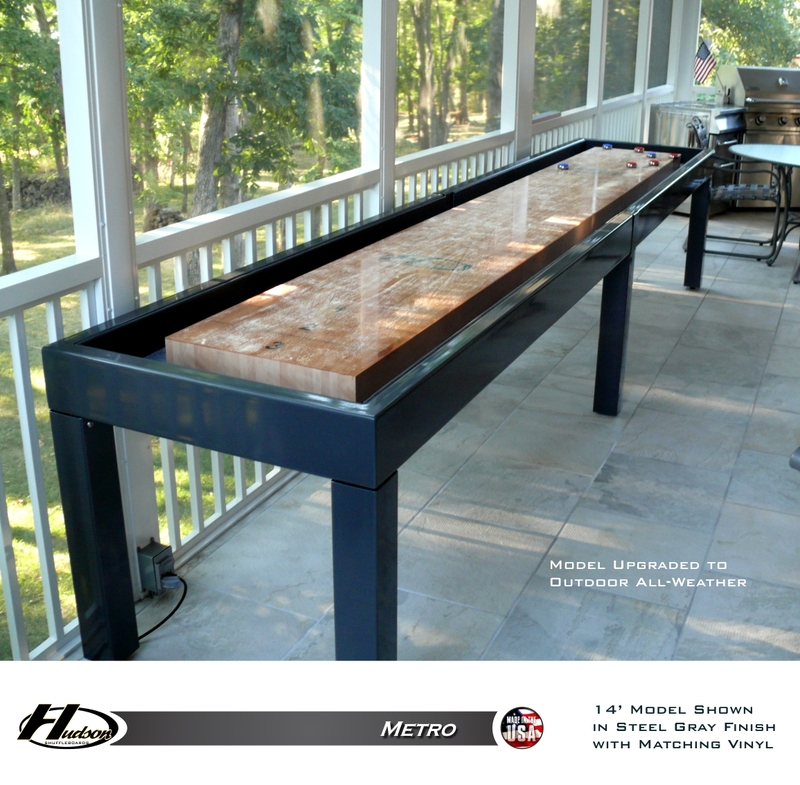 Shuffleboard.net offers the lowest price guaranteed on the Hudson Metro Shuffleboard table with free shipping in 48 states. On top of that, orders placed outside California pay zero sales tax! Get started on placing your order by contacting a shuffleboard expert right now!